USNTC Bainbridge - Members of Class "A" Teleman School Class 10-56, Bainbridge MD (November 14, 1955 to February 17, 1956). THIS IS A TRIBUTE TO ALL OF MY SHIPMATES (BOTH WAVES AND SAILORS) WHO SERVED IN THE U.S. NAVY AT USNTC BAINBRIDGE, MD! PRESERVING MEMORIES OF A TIME AND PLACE THAT NO LONGER EXISTS! Be sure to view my photo gallery for USNTC BAINBRIDGE MUSEUM, Port Deposit, MD Click on: http://lupacchino.smugmug.com/Other/USNTC-BAINBRIDGE-MUSEUM-Port/22539653_ZCWGwF#!i=1805464909&k=B5wW7gz USNTC Bainbridge is now gone and is open countryside. The vacant property was turned over to the State of Maryland. Today, there are very few landmarks left to tell that it was once a major training center for Sailors and Waves. For those that have lost or misplaced their 1956 Graduation Photo of Class 10-56 Teleman School at Bainbridge MD, I want to share this site with you and your family members who are looking for information about this period of our lives. IF YOU WERE A MEMBER OF CLASS "A" TELEMAN SCHOOL CLASS 10-56 AND HAVE PHOTOS YOU WOULD LIKE TO HAVE INCLUDED Click on here to Email me. I would like to hear from all shipmates or their families if you found this information helpful! Click on "MAP THIS!" icon above for locations of my photos in this gallery. Click On Thumbnails Below To Enlarge Photos for viewing and leave a comment if you wish.. For more information, Click on these links to: http://www.usntcb.org/ - USNTC Bainbridge "Preserving the memory and history of USNTC Bainbridge MD - 1942-1976 'Gone But Not Forgotten'"! http://www.powells.com/biblio?isbn=9780738544205 - United States Naval Training Center, Bainbridge (Images of America) http://www.geocities.com/Pentagon/Quarters/7736/bainbridge.html - USNTC Bainbridge/NAPS Association http://terraserver-usa.com/image.aspx?T=1&S=13&Z=18&X=252&Y=2740&W=1&qs=%7cport+deposit%7cmd - Ariel View of Vacant USNTC BAINBRIDGE. http://portdeposit.com/Bainbridge/bainbridge.htm - "How Did Port Deposit Get A Naval Training Center?" http://www.mde.state.md.us/assets/document/General/mdemar00.pdf - The End And Clean Up Of Bainbridge. http://usntcbainbridgemd.blogspot.com/ - USNTC BAINBRIDGE Blog hosted by 'Thomas' Take a look! 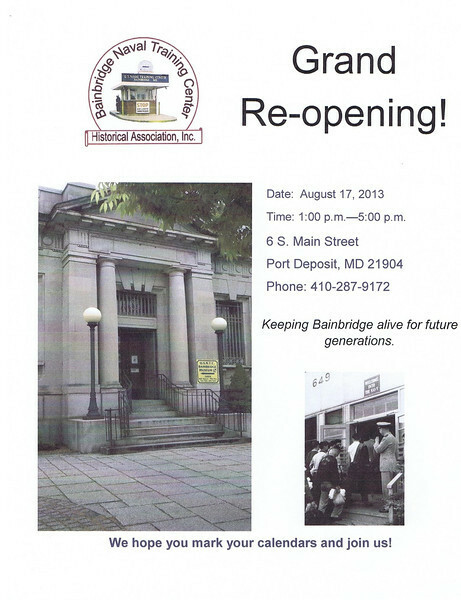 On Saturday, August 17, 2013 the USNTC BAINBRIDGE MUSEUM will celebrate their NEW HOME! Please plan on attending between 1:00 p.m. - 5:00 p.m. The Museum HAS MOVED downtown to a NEW LOCATION at 6 South Main Street, at the corner of South Main Street and Jacob Tome Highway, Port Deposit MD, and is NOW OPEN. Become a member and support the Museum's efforts to keep USNTC BAINBRIDGE ALIVE! OhioState Midshipman (USNR) joined enlisted for Korean campaign. Boot 1/c, 1953 Co. 272. Brigade Drill Team (male/female) leader for 8 consecutive weeks. TE A at Sdiego '54, subsequently to FAW1 staff (CTF72/Formosa Patrol), FAW4 staff (Whidbey). AV12, AV13, APD107. Direct commission WV ANG, Subsequent B-47 combat crew, SAC Hq, 3AF Hq (U.K.). Greatest memory was fire training, lead on the hose ("Gooseneck! "), because CPO didn't like me (ex-"officer" >midshipman). Was on USS Missouri BB63 for cruise in '52. Fair winds! I was in Bainbridge in June of 1955. Company 279, 4th reg, 44th Battalion. I sure would like to obtain any pictures of my time there at the center, can anyone help me obtain them? I was part of the "BERKSHIRE BATTALION" from Pittsfield, Ma. Looking for a pix of Patricia Potter who was a WAVE recruit (enlisted after high school in 1956) at Bainbridge. She received Radio Training level A at Bainbridge after her recruit training. She says she was probably the only WAVE in this class. Do your pix include her? If so, can I get a .jpg of it? From a comment posted by Murray While that he made on USNTC BAINBRIDGE Company 359 Galleries . . . I attended RM "A" scol Oct 1959-Jun 1960 and RM "B" scol Sep 1969-Jun 1970. The photos are excellent and bring back many fond memories. Bravo Zulu to all who contributed. My wife and I visited what was left of the base fall of 2009 and hardly recognized any of the area other than Port Deposit. The rusty main gate was padlocked so we couldn't get on the base. From what I've been told, over 400 bldgs were bulldozed and the base has returned to nature. I hope that a memorial is being considered to recognize the over 500,000 sailors who attended boot camp, school or was stationed there. I retired from the Navy in May 1979 as an RMC and if anyone recognizes my name, please send email me at mwkwhite@comcast.net.